robotics-university.com | The galaxy is vast and has experienced billions of years of collision and gravity attraction. Objects were thus formed and life began. The planet that is called THE EARTH has been chosen to nurture the seeds of life. The first Ring that stirred to wake chose for itself the color Green - the color of life. The green spreads from ancient woodlands to fields and plains, creating a soft, refreshing space that nourish the soul. Along with economic development, people and their negative impacts have been causing the green to disappear on the planet. It is spreading like an epidemic, threatening the green planet and the life on it. Natural disasters, floods, climate change ... The nature is raging. People's and individuals' awareness is the best vaccine to prevent the disasters that the Earth is having to suffer. Vietnam has chosen the theme THE GREEN PLANET for the ABU Robocon 2013 with the message: “Each nation is a piece of the puzzle that forms the world; the responsibility to protect the earth thus lies on the shoulder of each person living on it. Awareness and actions - that is what we need to sustain life in our common home THE EARTH”. 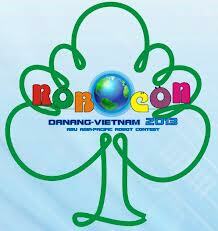 The ABU Robocon 2013 was held in Vietnam on 18 August 2013 where 19 Engineering teams from 18 countries participated. The theme & rules of ABU robocon 2013, Download here! 0 Comment For "ABU ROBOCON 2013 Vietnam"